Component of the CCR4-NOT complex which is one of the major cellular mRNA deadenylases and is linked to various cellular processes including bulk mRNA degradation, miRNA-mediated repression, translational repression during translational initiation and general transcription regulation. Additional complex functions may be a consequence of its influence on mRNA expression. Required for the CCR4-NOT complex structural integrity. Can repress transcription and may link the CCR4-NOT complex to transcriptional regulation; the repressive function may specificly involve the N-Cor repressor complex containing HDAC3, NCOR1 and NCOR2. Involved in the maintenance of emryonic stem (ES) cell identity. 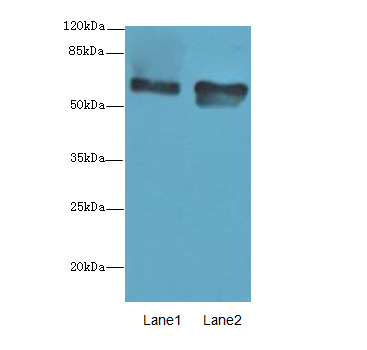 CNOT2 Polyclonal Antibody. Unconjugated. Raised in: Rabbit.